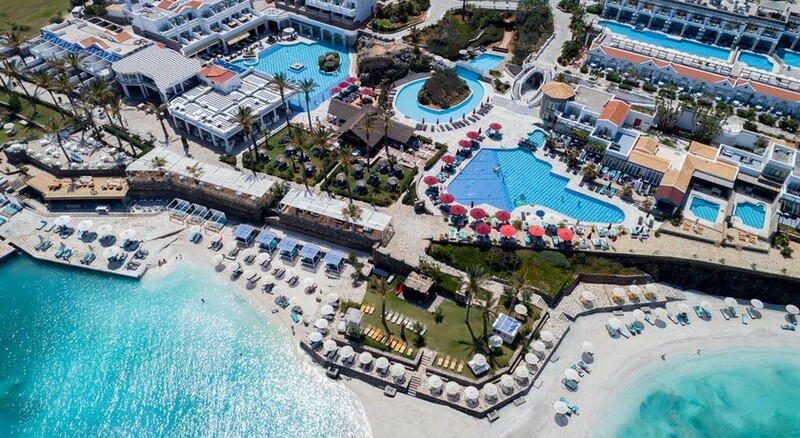 Nestled on the stunning Milatos Bay on the coast of the largest of Greek islands, Radisson Blu Beach Resort, Milatos Crete is the perfect retreat for a tranquil beach holiday. The five-star beachfront hotel boasts a private beach and seven outdoor swimming pools – an ideal spot for couples, honeymooners, families and friends. Guests can even soak in the sea views from the elegantly furnished rooms that come with terraces or balconies overlooking the glittering sea or the pretty garden. With five restaurants and four bars, the hotel is sure to treat the palate of every gastronome with an amazing variety of cuisines and world-class beverages. There are a number of outdoor sports and indoor games, as well as a watersports centre that offers water activities like water skiing, banana boats, jet skiing and many more. For ultimate relaxation, visit the on-site Boutique Spa. The hotel also offers varied recreation options, such as aqua park, live shows, piano bar, seafood evenings with live music and music band performances. Kids too are in for a treat with special facilities for the young ones, including a kids’ club and a water park. 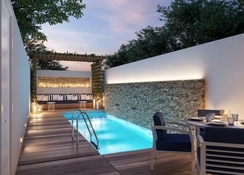 Radisson Blu Beach Resort is located between the Aegean Sea and Paraliaki Odos Milatou in Milatos Bay on the northern shore of Crete, close to a fishing village. The nearest town is Milatos, which is about 5 km from the resort, while the town of Sisi lies west of the hotel, about 8 km away. The Milatos town centre has a number of shops, restaurants and bars. The hotel is located about 45 km away from Heraklion Airport. A short drive from the hotel takes you to Crete that offers everything from ancient sites to modern nightlife. The popular resort of Aghios Nikolaos is 29 km from the hotel and is full of beautiful beaches and heritage sites. A number of tourist attractions in the nearby places include Knossos (51 km), Lasithi (48 km), Malia (14 km) and Elounda (37 km). 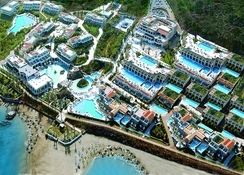 The elegant rooms and suites at Radisson Blu Beach Resort Milatos are built in two different architectural styles. The Aegean Collection is inspired by Crete’s ancient civilization and features chic interiors in Minoan colour schemes. The White Sensation Collection draws inspiration from Mykonos and its sister islands and displays contemporary pristine interiors. Guests can choose from a wide variety of rooms, which come with large terraces and balconies that provide splendid garden and sea views. Room amenities include air conditioning, telephone, full-length windows, specially designed beds with three levels of mattress, your choice of pillows, satellite TV with music channels, DVD player, housekeeping service, free Wi-Fi, minibar, tea and coffee making facilities, en-suite bathrooms with bathtub and separate shower cabin and bath amenities like bathrobes and slippers. The main restaurant, Mosaic, serves international buffets, including theme corners, show cooking, grill options, Mediterranean flavours and homemade desserts. The elegant Ariadni restaurant gives diners a taste of Crete with its authentic Cretan cuisine. International delicacies are offered at the 1948 Bellevue Restaurant. The poolside deli showcases Italian and Mediterranean flavours. On the Rocks Grill serves a barbecue buffet that includes grilled meat and fish, Greek appetizers, salads and a variety of desserts. Olivia dishes up light buffet options, such as pizza, pasta, salads and antipasti. The plush hotel has a choice of four bars. The Wet Bar by the pool serves cocktails, draught beer, house wine, Greek drinks such as ouzo or raki, plus juices, soft drinks and hot beverages. Guests can also enjoy premium alcoholic and non-alcoholic drinks at the Veranda Bar & Lounge. For adults, Radisson Blu Beach Resort Milatos has the relaxing Chill Out Bar, while families can enjoy ice cream, pies and snacks at Palm Garden Soft Bar. With private sandy beach, seven swimming pools and waterslides, holidaymakers are in for a treat at Radisson Blu Beach Resort. Out of the seven pools, four are for adults and three for children. There’s also an outdoor heated pool with fresh water. The resort offers loads of outdoor and indoor sports options and there’s also a watersports centre where you can enjoy water ski, banana boat, paddle boats, canoes and jet ski. The hotel provides a fitness centre, water gym, aerobics and a spa offering body massage, facial and beauty treatments, as well as hammam, sauna and whirlpool tub. Kids too will have a fun time with facilities like children’s swimming pools, three waterslides, Aqua Park, mini club, video games, kids’ disco and a playground. While guests can enjoy from a range of recreational activities during the day, evenings come alive with live shows, seafood evenings with live music, piano bar and band performances with international, Latin, jazz and local music. The hotel owns a luxurious Italian yacht on which you can cruise the Greek island and Aegean Sea. Rooms very comfortable, clean and spacious. Well kept resort with several pools in a quiet location. Only downside was food / restaurant wasn't of a high standard. Replenishment of food and slow service of cooks. Beverages and water expensive to be purchase. Great Hotel + Location. Very limited Veg option & majority of Waiters did not speak or understand English, therefore would state meat dishes are veg!